Keith Whelan's boat will be a little bigger than this - but he'll be wearing less clothes when he sets off from Australia next month. A 30-YEAR-OLD IRISHMAN has announced plans to become the youngest man to ever row solo across the Indian Ocean – and the first Irish man ever to navigate the route alone. But there’s one particularly unusual thing about Keith Whelan’s quest, which will see him row single-handedly from Australia to Mauritius: he’s going to do it while totally naked. 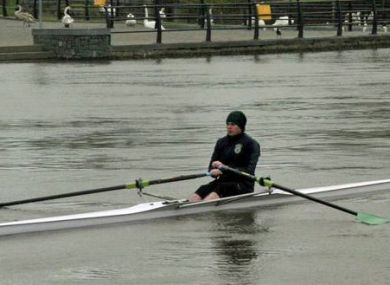 The Kildare native – an event management consultant based in Laois – has been preparing for his 120-day trek for around 18 months, and will be rowing for about 12 hours every day during that time: two hours on, two hours off, for four months solid. He estimates that the entire 6,000-kilometre trek will take about 1.8 million oar strokes, and that his trek will expose him to searing heat and ocean storms – but is adamant that he will remain unclothed for the entire trek. He’ll make the entire journey in a 23-foot Ocean rowing boat which is just 6 feet wide at its widest point, which will be fitted with a GPS unit and satellite phone allowing Keith to communicate with terra firma. On-board solar panels will allow him to run his limited stash of electrical equipment, which also includes a water maker and VHF radio – as well as enough gear to keep him blogging, updating his Facebook page, and tweeting despite his remote location. It’ll also be carrying 150 litres of ballast water – which will help the boat to regain its correct orientation if it capsizes, though it will also mean a heavier boat that will take a greater physical effort to shift. To achieve the world record, he will have to row to the longitudinal point near Maurius – 58°E – without his boat being touched by any other mechanism or human. He will also bring a few photographs, he says, and some messages and inspirational phrases to put inside his cabin. The challenge has a more philanthropic goal too, however: Keith hopes to raise €10,000 for anti-AIDS charity Keep A Child Alive, for whom he has already run the New York Marathon. Donations can be offered through his website, thenakedaventurer.com, which will also keep a live log of his position when he sets off next month. Email “Irishman aims to row solo across Indian Ocean - while naked”. Feedback on “Irishman aims to row solo across Indian Ocean - while naked”.